Want to add that buzzy World Cup drone to your special event, but cash is tight, and you can’t afford to drop ten clams on a genuine vuvuzela? No problem! Try the Glove-a-Phone! A boy and his Glove-a-Phone. Our young maestro does a respectable job, and backed by adult lungs and a few minutes of practice, a Glove-a-Phone will ring out with seven sustained seconds of slightly-mellowed vuvuzela-toot, ripe with strong fog horn undertones and a hint of barking elephant seal. Honestly, few things in this world sound more hauntingly beautiful. Before we continue, let me give credit where credit is due. The Glove-a-Phone concept comes from my son’s school teacher, a Board-Certified-Goofball, who got it from the RAFT, aka the Resource Area For Teaching, a Silicon Valley non-profit that turns donated materials into hands-on educational craft kits. Check out their excellent Idea Sheets, available online for free! 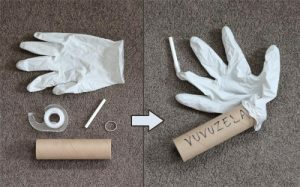 To make your Glove-a-Phone, you’ll need five ingredients: a powderless latex glove, cardboard tube, three-inch section of plastic straw, rubber band, and short length of scotch tape. Yes, you can scavenge it all, but do yourself a favor and invest twenty cents on a brand-new glove and clean straw to ensure an utmostly wholesome experience. The make-or-break component is the tube. In a pinch, a leftover toilet tissue roll will do, but the thicker the cardboard, the better. Institutional paper towel cores work perfectly – get clean ones from a school janitor or somewhere like the Depot For Creative Reuse. You’ll want something robust enough to keep its cylindrical shape under the pressure of excited hands and spittle. The Glove-a-Phone, Before and After. Confused? Refer to the RAFT’s handy instructions for clarity. God willing, you’ve now got a fully-formed Glove-a-Phone in your hands, yearning to be played! Pull the straw finger back so that the glove stretches tightly over the end of the tube, blow steadily into the straw, and voila! Bwooomp! Squeeze the fingers for faster attack, or let them free to buffer your breath. Pull harder or softer to change the pitch, and soon, you’ll be making music (recommended songs for beginners include Mary Had A Little Lamb and Smoke On The Water). Stick that in your pipe and smoke it, vuvuzela!